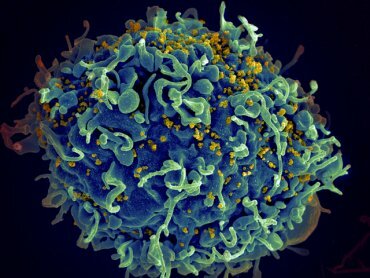 Genetically modifying cells to be immune to HIV just got better. Scientists today have something their HIV-fighting predecessors didn’t posses: the ability to edit genes. And for a mutating machine like HIV, gene editing might just be the light at the end of the research tunnel. That’s what researchers Judd Hultquist and Nevan Krogan at the UC San Francisco (UCSF), and Alexander Marson and Kathrin Schumann from its affiliate, Gladstone Institutes, took advantage of in a study published this week in Cell Reports. The UCSF and Gladstone researchers developed a new high-throughput, cell-editing platform using a variant of CRISPR-Cas9 — the breakthrough tool that enables editing genes using an enzyme called Cas9 and guide RNA (gRNA). Though not the first HIV research that used CRISPR, this new study is unique in the way it takes advantage of gene editing. Accordingly, some people are immune to HIV due to certain genetic mutations. With their new cell-editing platform, the researchers seek to copy the biology of these naturally HIV-immune individuals. The researchers built on CRISPR because it has proven effective on T cells, and because there are various genetic combinations that render people immune to HIV. The new technique allows researchers to mutate different candidate genes in hundreds of thousands of T cells from healthy volunteers. These mutant cells are then exposed to the HIV virus, checking which mutations effectively prevent infection. “If we want to start editing T cells and putting them back into people as a therapy, I think this will be the gold standard for how to do that quickly, safely, and efficiently,” Krogan said. For example, they mutated CXCR4 and CCR5 genes, responsible for encoding receptor molecules used by different HIV strains to sneak in and infect immune cells. Rendering either genes inactive successfully prevented HIV infection of human T cells by relevant HIV strain.